We all enjoy the long flowing bebop jazz guitar lines of the great guitarists such as Joe Pass, Wes Montgomery and Tal Farlow. Their lines seem to spell out the harmony of a song in a very clear and melodic way, whilst still sounding fresh and full of invention. Learning to play jazz guitar lines in the style of these players can be difficult if you don’t know the secrets and how they relate to chord changes. 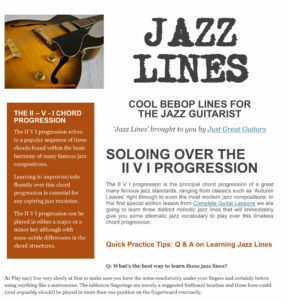 So Just Great Guitars have asked Pete Sklaroff from Complete Guitar Lessons to help us learn some classic bebop jazz guitar lines, and discover how we can apply them over that most common of all jazz chord progressions, the ubiquitous sequence of the II, V and I chords. Just play the chords Dmin7, G7 and Cmaj7 if you want to hear this for yourself. The lines are all written out in guitar tablature (tab) and standard music notation, so there’s no need to to be able to read music to learn them. And the sound examples are played over the chord backing so you can hear how each one sounds in a real performance situation.